This is one moist and absolutely fabulous cake! I tired it on a whim and so very happy I did. I simply topped the cake with a dusting of powdered sugar and a strawberry even though the original recipe calls for a chocolate ganache. DH enjoyed the cake and was totally amazed that there were bananas in the cake. 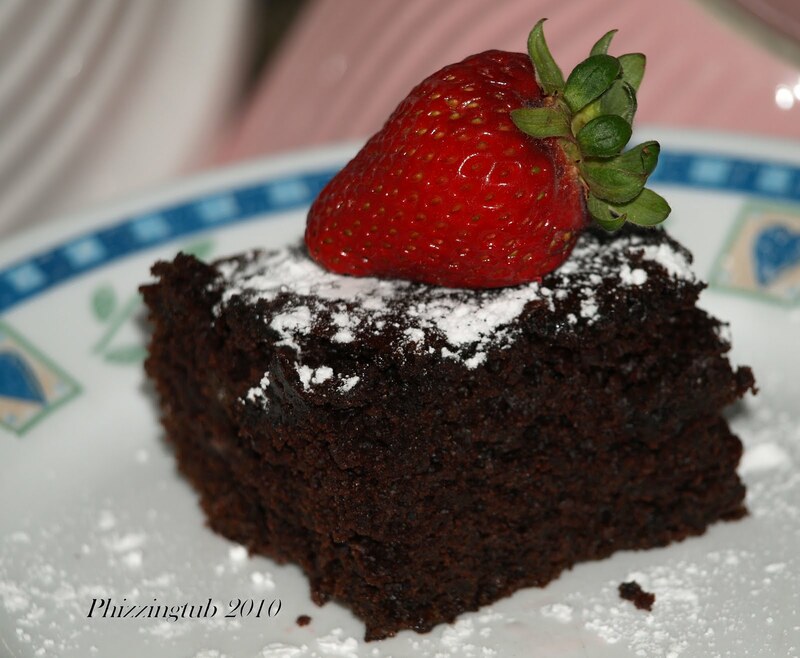 You can check out the original recipe here and see the ingredients for the ganache. Spray with a non stick vegetable spray, a 9 x 13 inch pan. Set aside. In a large bowl, whisk together the eggs, mashed bananas, water, milk, oil, and vanilla extract. Add the wet ingredients to the dry ingredients and stir, or whisk, until combined. The batter will be quite thin and it is alright. Per Serving: 134 Calories; 8g Fat (51.1% calories from fat); 2g Protein; 14g Carbohydrate; 1g Dietary Fiber; 27mg Cholesterol; 240mg Sodium. Exchanges: 1/2 Grain(Starch); 0 Lean Meat; 0 Fruit; 1 1/2 Fat; 0 Other Carbohydrates. Easy to top with powdered sugar and a strawberry.